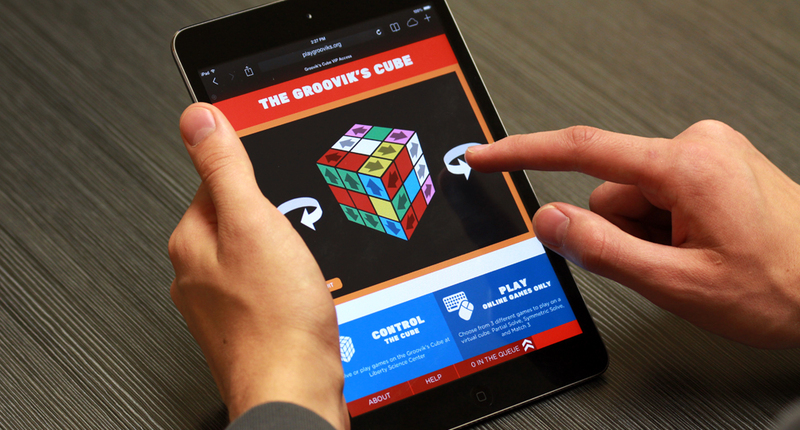 The Groovik’s Cube, featured in the Beyond Rubik’s Cube traveling exhibit, is an interactive Rubik’s Cube that visitors can solve from the museum or from anywhere in the world via the web. The Groovik’s Cube, the largest functional Rubik’s Cube (26 feet tall), was constructed by Mike Tyka and first displayed at the 2009 Burning Man festival in Nevada. Following its popularity there, it is now being featured at Liberty Science Center in New Jersey. 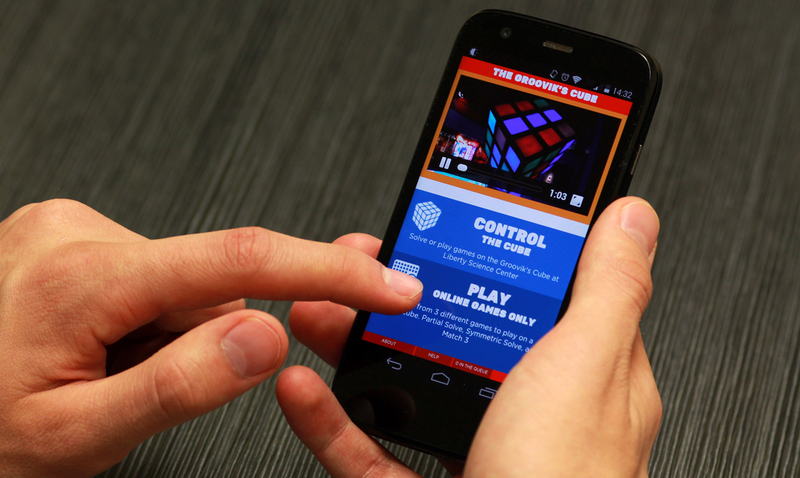 Ideum worked closely with Liberty Science Center to improve the interactive kiosks in the exhibit and build a new web and mobile application that allows visitors to solve the giant Rubik’s Cube. The Groovik’s Cube is a fully functioning Rubik’s Cube which can be solved through different interactive platforms. During Liberty Science Center’s visiting hours museum visitors can use one of three touch screen kiosks situated around the cube. Each screen has a model of the cube which they can manipulate, the moves made on the kiosks are mirrored on the Groovik’s Cube. Up to three visitors can play at any time, all collaborating to meet the same goal of solving the Groovik’s Cube. 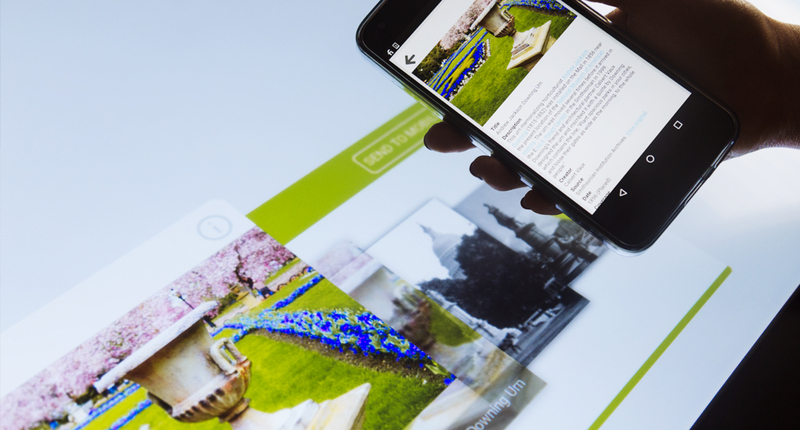 One of the many unique features of Groovik’s Cube is that people can play with it from anywhere in the world after museum hours. Once Liberty Science Center is closed to the public, anyone can log on to their website to see a live video feed of the cube and use the web version of the 3D model to solve the cube. 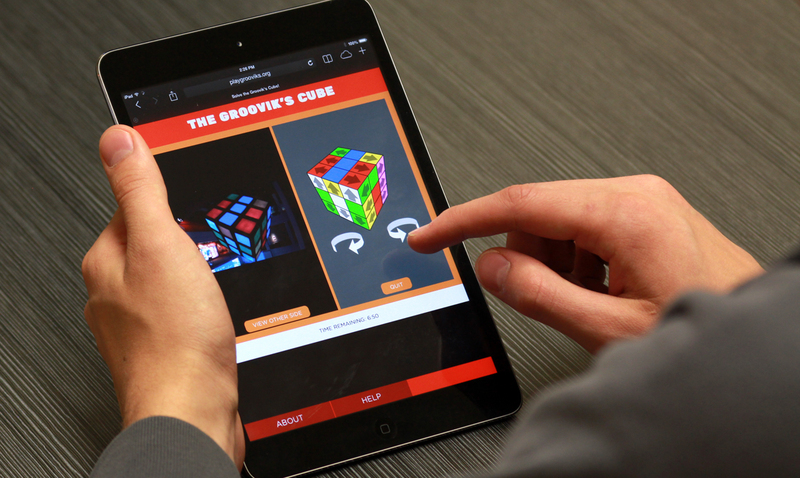 Working off of the original Groovik’s Cube software, Ideum redesigned and enhanced the kiosks and created a mobile and web version which enables users to control the cube over the web. 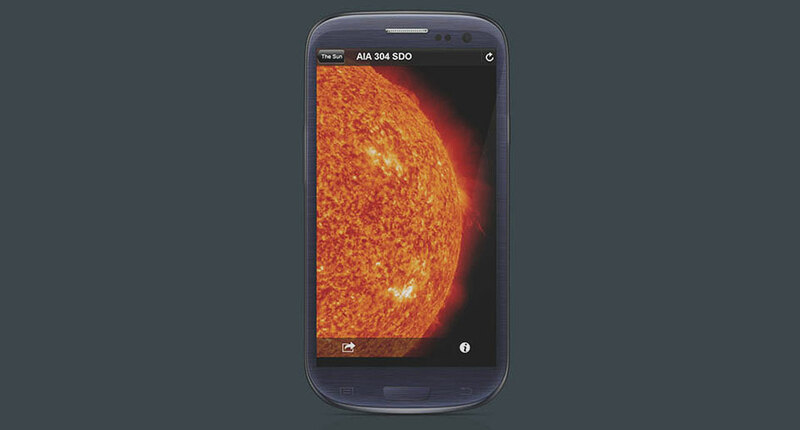 The web-based HTML5 application is fully responsive and works on a variety of iOS and Android-based devices. The Groovik’s Cube exhibition is on display now at Liberty Science Center. Web-based app provides several ways to work the cube. A tablet becomes a remote cube controller.